The students enjoying meeting Josie Lawrence for the first time. 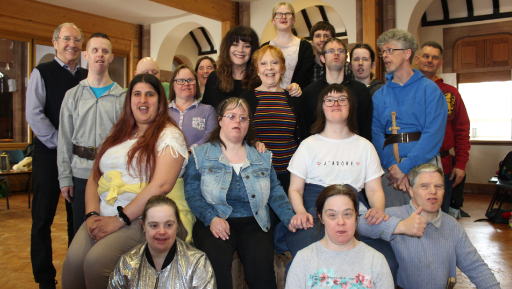 Our new patron - Josie Lawrence - came to visit us for the first time at our rehearsal this week. We were delighted to meet her and look forward to working with her over the coming months and years. Thank you Josie! Displaying one of the two trophies we won at the festival. 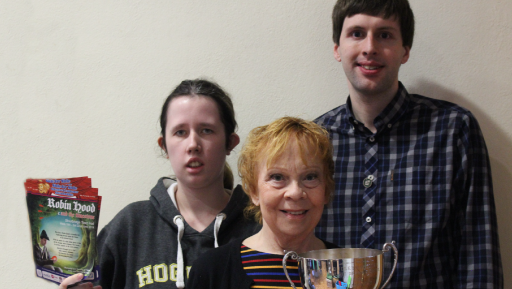 On Saturday March 23rd Side by Side Actors and Dancers came away with two trophies from the Dudley Festival of Music, Drama and Dance where we performed Act One of our new production: ROBIN HOOD & THE TIME STONE. Thank you for having supported us. The purchase of St John's Church in Stourbridge has gone through, and Side by Side is the proud new owner! From Autumn 2019 we'll have a brand new venue to rehearse and hopefully perform in. Thanks to all of you who've helped us get to this stage. We're excited about the future and if anyone would like to offer help with the renovations, or support of any kind, please do get in touch. Thank you, and we look forward to a bright 2019! Contact our theatre company for more information about any of our news articles.